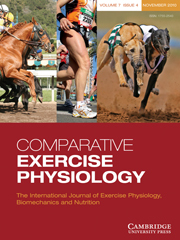 Comparative Exercise Physiology is the only journal specifically dealing with the latest research in comparative exercise physiology across all animal species, including humans. It offers an understanding of the physiological, nutritional and biochemical parameters that determine levels of performance and athletic achievement, through both primary and review material. The core subjects include: exercise physiology, biomechanics, gait (including the effect of riders), nutrition and biochemistry, injury and rehabilitation, psychology and behaviour, and breeding and genetics.